The Great Wagon Road extended though the area to the west of the modern Route 11 corridor. It crossed the Maury River at a location known as Campbell’s Ford (now Staunton) and the James River at Looney’s Ferry (now Buchanan). 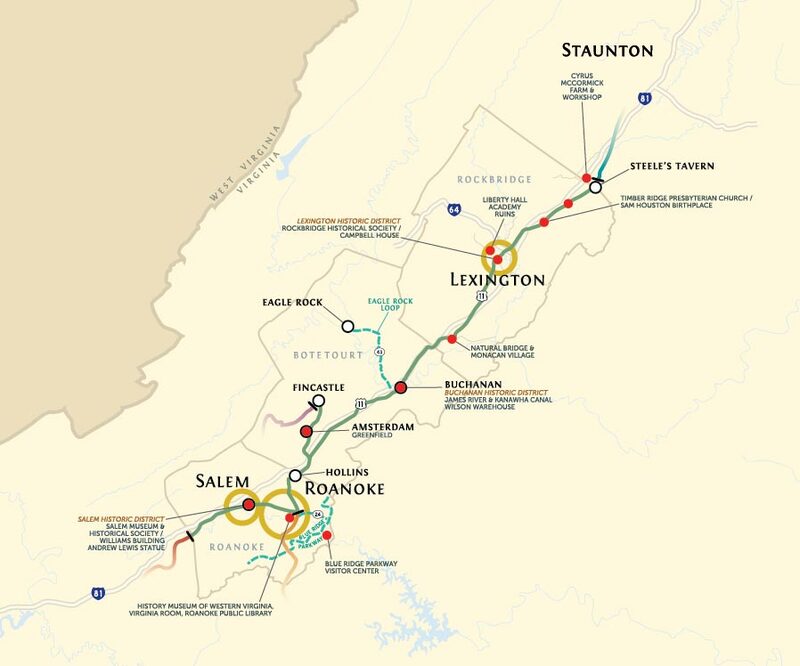 The historic road divides into the sections known as the Carolina Road and the Frontier Trail at the gap in the Blue Ridge Mountains near present-day Roanoke. The Roanoke County seat at Salem was formerly the location of an important Totero Indian village. The City of Roanoke was developed after the Civil War as a rail transportation center. Today, the Crossroads area is a thriving commercial hub near the intersections of important transportation corridors, where rail, air, and highway travel come together. Roanoke is the largest city on the Wilderness Road Trail. The area was settled at an early date by important historic figures and teems with museums, historic hotels, and shopping opportunities. Proximity to the mountains means easy access to the Blue Ridge Parkway and the Appalachian Trail. The museum at the Cyrus McCormick Farm and Workshop provides an opportunity for visitors to understand how traditional farming around the world was revolutionized by the inventions of a Scots-Irish family of farmers and innovators. Walnut Grove, the McCormick family farm near Steele’s Tavern, is the birthplace of the mechanical reaper, the ancestor of the modern combine harvester. This site is a key part of the story of the migration the Scots-Irish. Families like the Houstons of Church Hill began their American adventure in Pennsylvania and several generations later contributed to the growth and success of the American West. 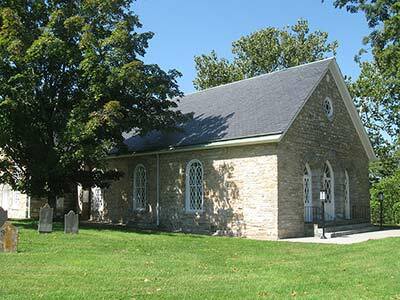 Timber Ridge Presbyterian Church was founded in 1746 by Scots-Irish settlers and the present stone building is thought to date from 1755–56. The area was the birthplace in 1793 of Sam Houston, one of the great figures in the settlement of the west and of relations between settlers and Indians. 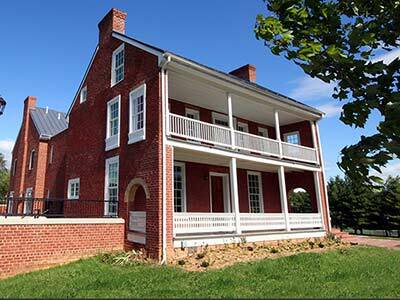 The Rockbridge Historical Society maintains three historic buildings in downtown Lexington. The most significant is the Campbell House, which houses the society’s collections. The museum is open for regular hours and admission is free. The Campbell House includes significant local furniture and artifacts of interest to family researchers. 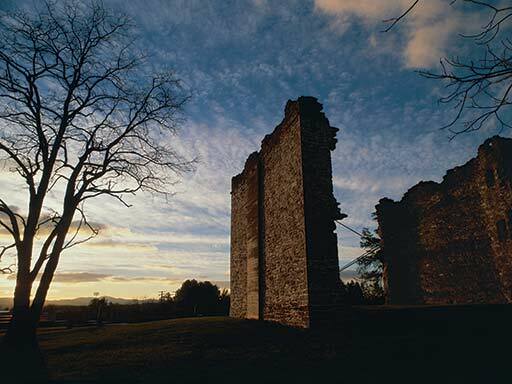 These picturesque stone ruins are the remains of one the region’s first educational institutions, founded by Scots-Irish Presbyterians. Augusta Academy opened in 1773 and received its charter as a college in 1782. Frame buildings housing the academy were replaced in 1793 by a three-story stone building to house the school’s students as well as the library, classrooms, and scientific equipment. The newly named Washington Academy moved into Lexington in 1803 after the stone academy building burned. It eventually grew into Washington and Lee University. 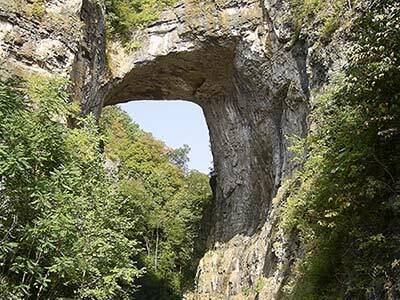 The dramatic 200-foot tall and 90-foot wide limestone arch over Cedar Creek was acquired by Thomas Jefferson in 1774 as a public trust to ensure protection and access. Together with Niagara Falls, Natural Bridge was ranked as the continent’s most impressive natural landmark in the eighteenth and early nineteenth centuries. Today the site is served by a complex of Colonial Revival buildings, including a large hotel. The Monacan Indian Nation of Virginia has joined with Natural Bridge to present a Native American Village complex at the site, staffed by living history guides in reproduction work shelters and houses. 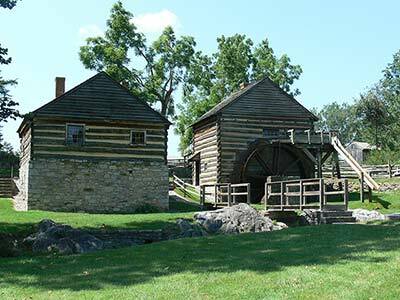 The picturesque town of Buchanan, founded in 1811, is located where the Great Road crossed the James River. 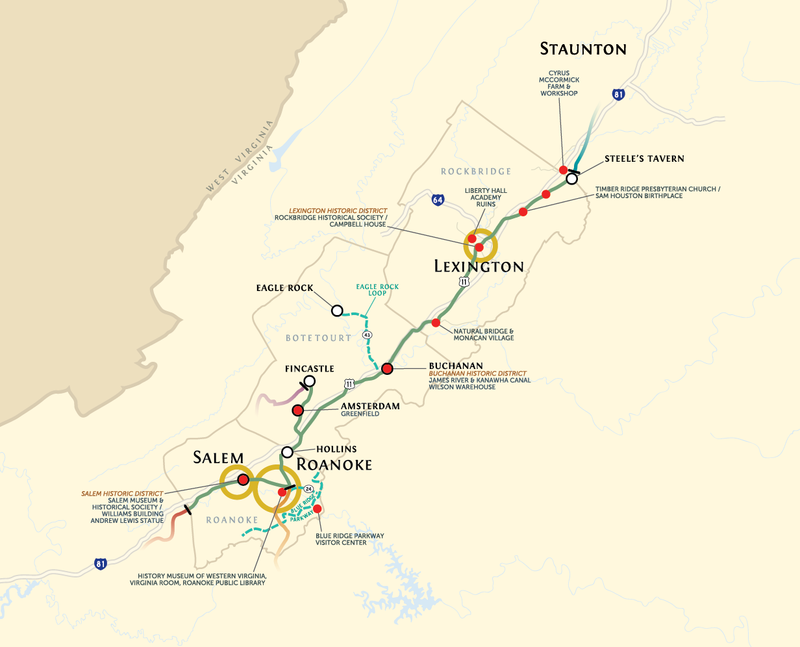 The “Main Road to the Western Country” in Buchanan’s heyday coincided with the completion of the James River and Kanawha Canal into the Valley of Virginia in 1851, allowing produce from the valley direct access to eastern Virginia markets without an arduous trip by turnpike over the Blue Ridge. The Wilson Warehouse was built in 1839 as a combined store, warehouse, and residence. It was restored as the town’s “community house” in 1938. Col. William Preston (1729–1783) played a crucial role in surveying and developing western lands. He exerted great influence in the colonial affairs of his time and ran a large plantation here. He served in the Virginia House of Burgesses and was a colonel in the militia during the American Revolutionary War. Preston settled his family at Greenfield in 1762, but moved his growing family farther west to a new plantation, called Smithfield, twelve years later. The surviving properties at Greenfield include rare examples of nineteenth-century domestic architecture associated with the Preston family and the era of slavery. The Blue Ridge Parkway Visitor Center serves as a gateway to the spectacularly beautiful scenic highway that runs along the crest of the Blue Ridge through Virginia and North Carolina. The landscaped parkway was founded in 1935 and completed by public works organizations during the Great Depression. It is lined with sites depicting local history. Visitors will find information about the Parkway and the Roanoke Valley and enjoy a shop featuring gifts and Parkway memorabilia. There is also access to a series of scenic trails. The Roanoke History Museum is located in Roanoke’s lively and historic Market Square. The museum’s main exhibit, entitled Crossroads of History, interprets 10,000 years of western Virginia’s heritage through artifacts that span the entire history of the region. Among the nearly 6,000 items in the Museum’s collection are Native American arrowheads, pottery, and a rare example of “Rawrenoke” beads (from which the city derived its name). Renowned frontier soldier and Revolutionary War hero General Andrew Lewis lived between the modern civic center and the Roanoke River at a farm called Richfield. 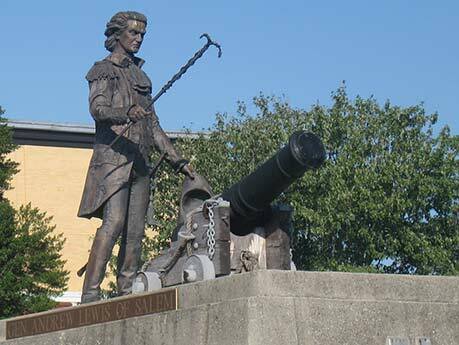 A statue of Lewis at the Battle of Gwynn’s Island has been placed outside the Salem Civic Center, and a portrait can be found inside. William C. Williams, the builder of the first Roanoke County Courthouse, constructed this unusual brick home and store in Salem in 1845. The building was relocated and restored in 1992 to serve as a museum containing local Indian artifacts and mementos of daily life from across the span of Salem’s history. The Museum Shop features books, crafts, replicas, educational toys, and more. Fincastle was one of the first communities in the original area of Botetourt County, founded in 1772. The town is an outdoor museum of late eighteenth- and early nineteenth-century American architecture. The Cumberland Gap Road (Fincastle Turnpike) was authorized to run between Fincastle and the Kentucky line in 1831. The museum building, located in Court House Square, was erected circa 1800. 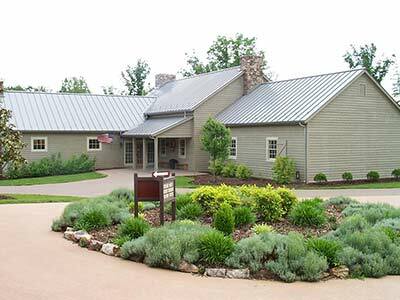 It serves as a repository for hundreds of artifacts that interpret the history of the county.